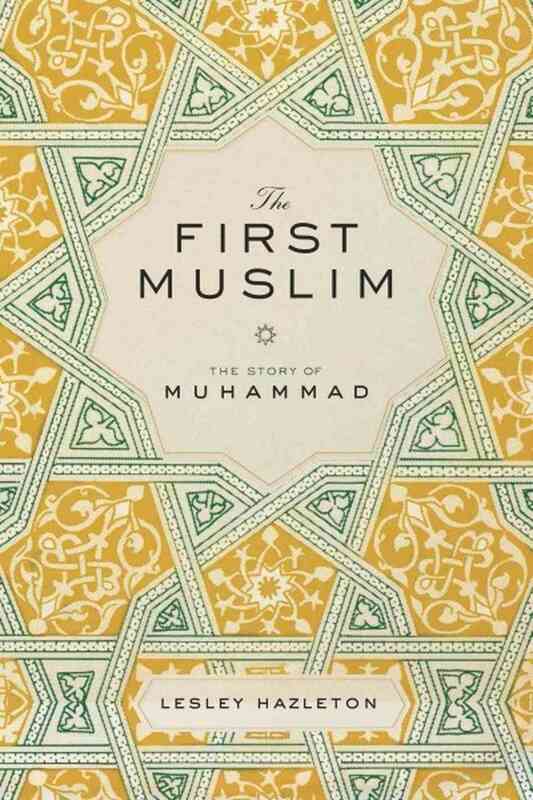 I have been reading with great pleasure a new book out (Feb 2014) by Lesley Hazleton titled "The First Muslim." This is a greatly researched book and she did look at the life of the most important figure in human history from a very fresh out of the box perspective. I say out of the box because she wasn't biased through the lens of religious affiliation, biasedness or over piety that we often see in other biographical account. And because she had a fresh eyes and mind, she could also give her very important commentary on various incidents of the Prophet which both Non-Muslim and Muslims particular will appreciate. I have not read the life of the Prophet with so much freshness than any other book before. Yes other biography may have things more detailed, taking into account both reliable and not so reliable sources, but this work of author Lesley Hazleton stands out more uniquely because she not only relied on authentic sources but also pointed out gaps in other traditional stories that generally get circulated about the life o the Prophet among the pious Muslims. The description of the experience of the Night Journey is 'a concretization of what cannot be made concrete - a translation of the metapysical into the physical,' argues the author and I think thats her genius to come to appreciate that. On the blessed occasion of Mi'raj, let me share the part from Lesley Hazleton's book and I hope you will come to enjoy them. ... Yet it was at his point of utter insecurity, when it seemed he was forced to focus on the most down-to-earth matter of survival, that he would soar instead. The isra, the Night Journey, would become one of the most symbolically weighted events of his life. Hordes of angels greeted him on his arrival, and as he dismounted, he was offered a choice of three goblets from which to drink. One contained wine, the second milk, and the third water. He chose the milk as the middle way between asceticism and indulgence, and Gabriel was delighted: "You have been rightly guided, Muhammad, and so will your people be." "Then, Muhammad is quoted as saying, "a ladder was brought to me finer than any I have ever seen. It was that to which the dying man looks when death approaches." Led by Gabriel, he climbed the ladder and ascended through seven circles of heaven presided over by, respectively, Adam, Jesus and John, Joseph, Enoch, Aaron, Moses and finally in the seventh and higher circle - at the threshold of the Divine sphere - Abraham. This is the essence of the Night Journey as given by ibn-Ishaq, who is quite clear that while he has been told one form or another of it by many people, he is unsure as to how reliable any of them are. Carefully choosing his words, he introduces the episode this way, "This account is pieced together, each piece contributing something of what that person was told about what happened." And to indicate that the story may be more a matter of faith than of fact, he makes ample use of such phrases as "I was told that in his story al-Hassan said..." or "One of abu-Bakr's family told me that Aisha used to say..." or "A traditionalist who had heart it from one who had heard it from Muhammad said that Muhammad said..."
The story is not told in the Quran, though the verse that begins Sura 17 is understood as a clear reference to it, "Glory be to God, who made his servant go by night from the sacred house to the far house, that we might show him some of our signs." From the sacred house of the Kaaba sanctuary, that is, to the far house of the Jerusalem one. In the light of this Quranic verse, ibn-Ishaq sums up his reportorial dilemma this way: "The matter of the place of the journey and what is said about it is a searching test and a matter of God's power and authority, wherein is a lesson for the intelligent, with guidance, mercy and strengthening for those who believe." It's a wisely phrased abstention from certainty. Whether the Night Journey was a dream, a vision, or lived experience, ibn-Ishaq's view is that what matters is not how it happened, but its significance. He steps carefully between his duty as a believer and his obligation as a biographer - a delicate balancing act that he carries out with considerable aplomb, finally threading the needle with this conclusion: "I have heard it is said that the messenger used to say, "My eyes sleep while my heart is awake." Only God knows how revelation came and what he saw. But whether he was asleep or awake, it was all true." Not every early Islamic historian would agree. Al-Tabari, writing a century later in the new Muslim capital city of Baghdad, was wary as always of miracle tales and far more focused on politics. Despite his repeatedly acknowledged debt to ibn-Ishaq, he would omit the episode altogether in his multi-volume history, and ignore the much-quoted dictum attributed to Aisha, speaking many years after Muhammad's death: "The messenger's body remained where it was, but God removed his spirit by night." Was the Night Journey simply a dream, then? But there was no such thing as "simply a dream" at the time. Freud was far from the first to recognize the symbolic weight of dreams, nor did he invent dream interpretation; he invoked the new science of psychology to resuscitate an ancient practice in which sleep was understood not as a passive state, but with the right preparation as an active experience of soul. The ritual known as dream incubation was highly regarded in both Greek and Roman times, when people would purify themselves by fasting and meditation before sleeping in a template precinct in order to receive divine guidance in dream. And throughout the Bible, dreams are a manifestation of the divine. "If there be a prophet among you, I the Lord will make myself known to him in a vision, and will speak to him in dream," Yahweh says to Aaron and Miriam. Joseph's skill at dream interpretation made him a senior counselor to Pharaoh, while Abraham, Jacob, Solomon, Saint Joseph, and Saint Paul were all visited by God as they slept. The tradition continues in the Talmud, where dreams channel divine wisdom. According to one Midrash, "During sleep the soul departs and draws spiritual refreshment from on high" - a statement very close to the one attributed to Aisha. Later rabbanical tradition would prize the she'elat halom, literally the "Dream question" or rather, a dream answer to a waking question. The mystical aspect of dreams would be incorporated into the thirteenth century Zohar, the foundation book of Kabbala, which would identify the angel Gabriel as "the mater of dreams" and the link between God and human, as he was for Muhammad. One story about the Kabbalist master Isaac Luria even has Gabriel appearing to him in a dream wielding the stylus of scribe. Muslim philosophers and mystics played an equally important part in the tradition. Two of the greatest, ibn-Arabi in the twelfth century and ibn-Khaldun in the fourteenth, wrote extensively about alam al-mothal, 'the realm of images' in which dreams were the highest form of vision of divine truth. Ibn-Khaldun wrote that God created sleep as an opportunity to "lift the veil of the senses" and thus gain access to higher forms of knowledge. Several hadiths - traditional reports of Muhammad's sayings and practice - show him counseling his followers on the preparatory ritual of purification and prayer known as istikhara, which was to be used either when awake, in which case divine response would come in the form of "an inclination of the heart," or just before sleep, when it would come in a dream. The journey is still the subject of disagreement between those Muslims who see it as a mystical experience and those who take it more literally. Brightly colored posters of Buraq , the winged white mare whose name means "lightning", hang in many Muslim homes throughout Asia, North Africa, and the Middle East, the details of her saddle and trappings varying according to local folk-art traditions. 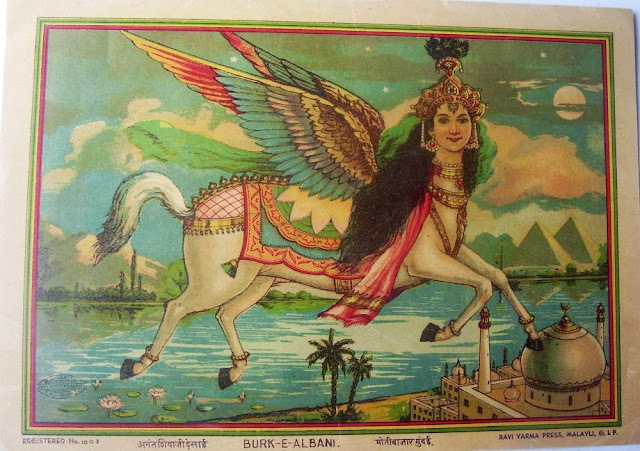 But for the most part, this image of Buraq is not taken literally. It's a concretization of what cannot be made concrete - a translation of the metaphysical into the physical. And the same might be said for the account of the journey itself. The question has to be not whether Muhammad "really" flew overnight to Jerusalem and back, but what his experience of it meant. As in Jacob's dream in the book of Genesis, a ladder led up to heaven. But where Jacob remained sleeping at the foot of the ladder, Muhammad saw it as "that to which a dying man looks," and climbed it. Did he feel as though he was dying, as he had during the first Quranic revelation on Mount Hira? Was this the death of the self that has been the goal of mystics of all faiths, the better to unite with the divine? Or did it seem as though he had taken leave of his body and hovered above it, looking down at his earthly self as some who survived near-death experience report having done? .. Certainly the Night Journey is deeply symbolic in psychological terms, coming as it did when Muhammad was at his most vulnerable, sure of his mission but deeply unsure as to where it would lead him or how. The images of flight and ascension are expression of freedom and transcendence, of escaping the particulars of daily life to soar beyond them. In fact the journey could be seen as a kind of over compensation for the double loss of Khadija and abu-Talib. Even as he was mired with terrible loneliness of grief and made to feel more isolated in Mecca than ever, the episode acted as confirmation that Muhammad was not alone; he was welcomed within the community of angels, and greeted by the great prophets of the past as one of them. But just as a miraculous understanding of the journey ends up reducing it to a simple matter of yes or no, belief or disbelief, so this kind of psychological interpretation undermines its real significance. Because here is where it can be said that Muhammad fully assumes what the Hebrew bible calls "the mantle of prophecy." The man old earlier to say he was "just one of you" and "just an ordinary man" is now specially graced. "Just one of you" does not fly hundreds of miles through the night to consult with angels and prophets and ascend into the divine presence. Muhammad is no longer the passive recipient of revelation but an active participant; he flies, ascends, prays with the angels and speaks with the prophets. Whether physical or visionary, walking reality or dream reality, the Night Journey marks a radical change, This is where Muhammad first understands himself not merely as a messenger but as a leader. It is here, when his future in Mecca is most in doubt, that he sees himself projected into the future. "Thy seed shall be as the dust of the earth, and thou shalt spread abroad to the west and to the east, to the north and to the south," Yahweh told Jacob in his dream, and in a similar way, the Night Journey was the promise of the future of Muhammad. It represents a leap forward to a new level of determination and action, one that would give him the resolve to uproot himself from the bonds of clan and tribe, and fully commit himself to the radical implications of his message. I strongly recommend this book: The First Muslim by Lesley Hazleton for anyone who is interested to know the life of the Prophet and his enigma. For example G. Willow Wilson said in his review, "The most readable, engaging study of Muhammad I have ever come across." I couldn't agree more. Reza Aslan said, "Hezleton sets her keen eye and her sculpted prose on one of the most fascinating and misunderstood figures in history... This is a wonderful book." Click on the cover below to order the book (available in Kindle, Paperback or Hard Cover) via Amazon. * Who was Ibn Ishaq?